Presently the method used is to simply combine (join) the Horizontal and Vertical Refresh lines from the VGA Adaptor, and feed them directly in to the BA ICC Video connector, without any filtering, or electrical circuitry. Although this method does indeed work, it is far from ideal, and should be used with due caution. The Reader is also reminded that exceeding the Vertical and Horizontal Refresh Rates could cause damage to the Ford BA ICC Screen. It is therefore HIGHLY RECOMMENDED that the reader uses their own judgement as to the fitness of this modification as it currently stands ! Firstly, a big thankyou must go out to the following people for their effort, and hard work that has gone in to testing and troubleshooting this modification. This document describes the methodology used in fitting, and wiring the BA Premium Colour Screen VGA Input Connector. The Colour ICC Screen has a Video Input, which Ford uses as a Video Screen for the DVD based Satellite Navigation System, supplied by VDO / Dayton. During the operation of the factory Satellite Navigation System, a live Street Directory is drawn in the background of the ICC Screen, with the original Radio, Climate Control, and Trip Computer display overlayed on top of the Sat-Nav image. Upon operation of the Satellite Navigation Remote Control, the Vehicle overlays are switched off, so as the Sat-Nav information is only Displayed. 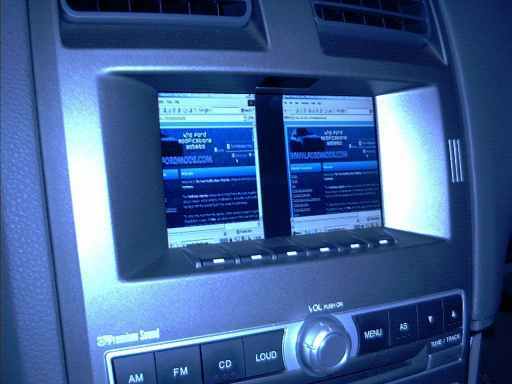 The Satellite Navigation System is controlled via an Infra-red port, located above the ICC Screen, below the Air vents. 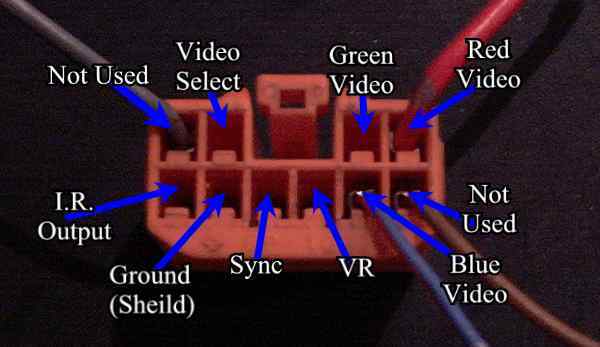 The wiring for this Infra-red port is also accessible through the Video wiring connector, although its function is some what limited due the I.R. Port only having a Receive Port, and no Send functionality. The Premium Sound System Colour Information Command Centre Screen (Premium ICC), is a 20cm by 15-cm Colour LCD Screen. The maximum Resolution of the Screen is as of this moment, unknown, but the resolution of 640 x 480 pixels with a vertical refresh rate of 60Hz, and a Horizontal Refresh rate of 15.7kHz. Note : At this resolution, the Video does not quite fill the display area of the ICC Screen. It is therefore assumed that the Premium ICC Screen can and does have the capability to display higher resolutions. The Video Select Line allows turning On and Off, the Vehicle Status overlays on the Premium ICC Screen, which include the Heater, Ventilation, Air conditioning, Radio Status, and Trip computer information. This Line allows the Ford Factory Satellite Navigation System Remote Control to function, by providing an interface to the Ford BA ICC Infra Red port, located above the ICC Screen. As a final note: Unfortunately the BA Colour ICC Screen is not VESA, or DPMS compatible, meaning that the Display does not support Multi Sync modes, Power Management, or Monitor Data Display Communication. This basically means that the Premium Sound System Colour Display does not support the following features. No support for different Horizontal, and Vertical Frequencies, image resizing and positioning. The Ford Falcon BA Premium Sound System Video Connector used for the Satellite Navigation System is a non-standard, 10 pin connector. There is no actual RCA, 15 pin D shell VGA Connector, or S-Video connector fitted to the ICC module. This unique connector means that before even attempting to connect a P.C., or laptop to the BA Colour ICC Screen, you will need to source a suitable connector that will fit on to the BA ICC Video Connector. Fortunately for you, all the hard work has been done, and this connector can be sourced for very little cost, from EF and EL Series Ford Falcons, from wreckers, at a very small cost. Once you have sourced the connector, you will need to add some wires, and pins to the connector, and finally solder a 15 Pin D shell VGA connector on to this connector, for connecting a Personal Computer, or Laptop unit. The following is a list of parts required to make your own VGA Display cable, that will connect directly to the Ford BA ICC Premium Colour display. 1 x At least a length of "6 core shielded" wire, preferably though a 9 core shielded wire, in a length suitable to connect your P.C. or laptop to the BA ICC, from the PC/Laptop Mounting position. The following is a description of each part required, where the part can be sourced, and the cost of the part, as of December 2003. The Ford EF and EL Model Falcons have provisions for a power antenna height adjustment switch, even though this function is only available for Fairmont, Fairmont Ghia, Fairlane, LTD, and GT model EF and EL Falcons. 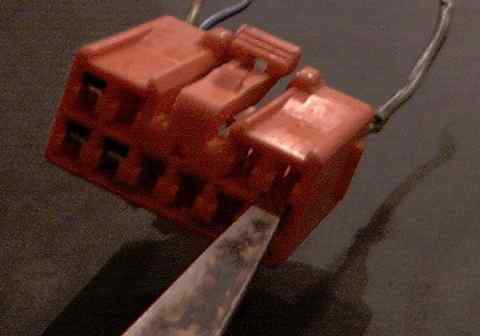 This wiring connector has been fitted to all Ford EF and EL Vehicles, regardless of factory fitment of a power antenna. Fortunately for our purposes, this wiring connector is an exact fit for the BA Colour ICC Video Connector. Also, a second connector is also available with these model falcons, that can also be used for the Ford BA Colour ICC display. This connector is the Rear Window Demister Switch, and is located 1 plug below the Antenna Height Adjustment Switch, just left of the Heater and Air-conditioning controls on the EF/EL Falcons. 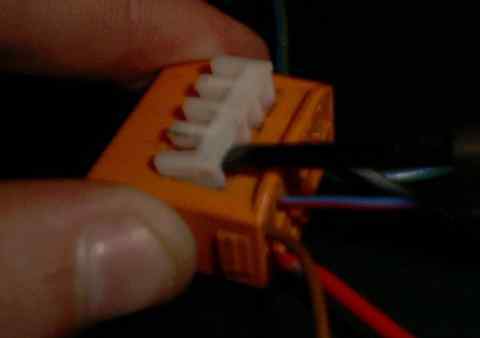 If you are pulling these connectors from a working vehicle, it is obviously NOT RECOMMENDED that you remove the rear window demister switch wiring connector from the vehicle, as this will prevent the Rear window demister from functioning. Finally, due to the Antenna Height adjustment switch not being fitted to EF/EL falcon models, such as GLi, futura, XR6, XR8, (both wagon and sedan), many wreckers will not be too concerned about cutting these plugs from the wiring looms of wrecked EF/EL model falcons. The cable used for the Ford BA Premium ICC VGA connector should have AT LEAST the following specifications. It should be shielded / screened - This basically means that the cable has a metal sheath inside, that surrounds the inner wires. This sheath is used to "screen" out any electrical noise from the wires and signal carried within the cable. The cable should have AT LEAST 6 cores - This is the minimum requirement to carry all the signals from the P.C. to the Ford BA Premium ICC Screen. This includes the Red, Green, Blue, Horizontal, Vertical, and Ground Signals. A 6 core cable assumes that you will either ground or open circuit the Video Select Line at the BA ICC Video connector. The Video Select Line either turns the Vehicle Status Overlays On or Off within the screen, depending on the status of the Video Select Line. If this line is grounded, then the Vehicle overlays such as the Heater / Air-conditioning, Radio, and Clock status will be switched off, allowing an un-interrupted view of the VGA Input. If this line is left disconnected, then the Vehicle overlays will be displayed, above the VGA Video Input. (I.E. The Video input will become a background for the BA ICC display). It is for this reason that we recommend you use a 9 Core shielded cable, so as you can run a Video Overlay On/Off switch to a more accessible location. Finally, a 9 Core Cable will allow for running an extra line to utilise (At a further date), the signal line for the BA Premium ICC Infra-Red Port, fitted above the ICC Screen. The following is a list of Cables, costs, and Catalogue Numbers, from a few electrical suppliers. The above image shows the Ford EF / EL Falcon Power Antenna Height Switch Connector, and its pin outs. This unfortunately requires a further 6 wires to be added to the Connector, in order for it to be used for the ICC Video Connector. (Not Recommended) - Buy some Mini Spade connectors, and physically modify them by squashing them to fit the Connector. Once you have sorted out the adding extra wires to the connector problem, you will then need to solder your shielded core cable to this connector. Remember to have your shielded core cable long enough to be hidden away and routed within the interior of your BA Falcon, to the desired mounting point of your PC or Laptop. A length of 2 metres is recommended, as this gives very low signal degradation, but allows for a fair amount of play when choosing a spot to mount your PC. 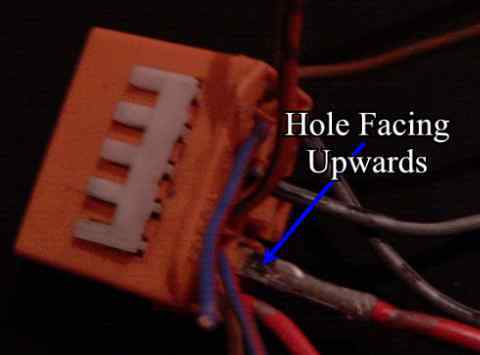 The following is a description of each of the lines that you will need to solder to your Plug. The following image shows the VGA Solder Connector, and the Lines that must be soldered to it, in order for it to work with the BA ICC Screen. Note : Pins 13 and 14 on the VGA Connector are connected directly together, and are then connected up to the BA ICC Sync Input. Connecting these lines together gives a resulting (un filtered) Combined H+V Synchronisation that is required by the BA ICC Screen. This program was written by Paulo Sergio Coelho, and makes playing around with the BA ICC a breeze. At this point in time, members are currently working on a more practical Video Synchronisation Circuit, which will allow for better picture quality, and allow the Ford BA VICC Video connector to work with a larger range of video cards. For the moment, the following Video Cards have been tested, and have been found to work with the Ford Falcon BA Premium Sound System Video Display. ArcadeVGA - Quite possibly the very BEST video card to be used for this application, as no specific software is required for it to operate with the BA ICC Screen. The plug colour shown in this picture is blue, but it could also be orange as well. 2) To the left of the ashtray, there is one screw, remove this screw. 3) The radio shroud should swing upwards from the top. Swing the shroud 45 degrees upwards. Remove the Cigarette lighter plug by squeezing the top clip, and pulling on the socket. Also remove the cigarette lighter lamp, by twisting the plug 90 degrees anticlockwise. 4) Remove the radio shroud by pulling it towards you. See figure 1. 5) Remove the two Philips head screws located above the Radio. 6) Remove the 3 Screws located above the instrument panel. 8) Remove the Screw located beneath the Fuel Flap Release switch. 9) Pull the main Dash Panel away from the Dash. There are three clips located at the top of this panel. and 1 clip located near the door unlock switch. It is normal for this part to require some force. 10) Once the clips have disengaged, lift the panel upwards, so as the two tabs located near the Shift console are disengaged. 12) Unplug the switches (Antennae Height adjust, Rear Window Demister, Door Lock/Unlock, Boot Release, Fuel Flap Release) Please note: with exception to the Fuel flap release, and Boot release switches, all the plugs are keyed so as to make it impossible to connect the wrong plugs to the wrong switches. 13) Remove the Main Panel. See the above picture. 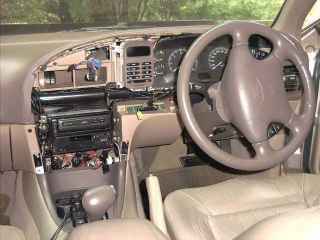 Once the instrument cluster panel has been removed, you will now have ample room to cut the Antenna Height Adjustment Switch wiring plug. This plug is the Upper most plug, located to the left of the Heater/Air-conditioning Controls, and on non Fairmont/Ghia Models, it will be simply plugged in to a switch blanking socket. If you decide to use the Antenna Height Switch or Rear Window Demister switch from an EF/EL Model falcon, you will need to make some changes to the connector in order to make it suitable for the BA ICC Video Screen. The Ford BA Colour Interior Command Centre Screen Video Input requires 8 Pins fitted to the plug and unfortunately, the Antenna Height/Rear Window Demister Plugs only have 3 Pins fitted. Also, 2 Of the Factory Fitted Pins on the Connector will need to be moved to new positions, as they have been fitted to positions that are not used. Luckily adding and moving these extra Pins and Lines to these plugs is a rather simple process to carry out, and shouldn?t take any longer than 15 minutes to carry out. OR (second Preferred Requirement) - a Ford Plug, with at least 5 Pins/Lines fitted that are of the same size and type as the ones fitted to the EF/EL Antenna Height/Rear Window Demister Plugs. 2) A white plastic locking mechanism, that is located at the top of the connector. In order to Remove, move, or add ANY pins to a connector, you will need to remove the white plastic pin locking section located at the top of the plug. To do this simply use a small flat headed screwdriver, to ply the white locking mechanism outwards, away from the connector. NOTE : You do not need to completely remove this locking mechanism in order to remove / move / or add pins to the connector, it simply needs to be disengaged. The following picture gives you a better idea of what the locking mechanism is, how to pull it out using a jewellers screwdriver, and the amount it needs to be moved outwards, in order for the pins to dis-engage. 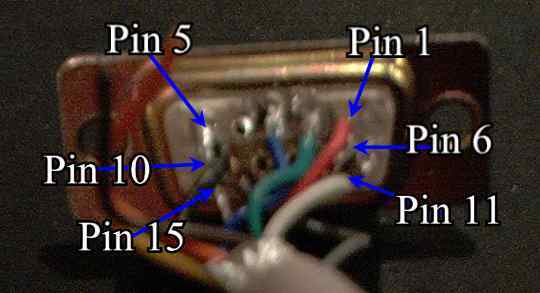 Once the above step has been completed, you will then be able to add pins from other connectors by simply pushing the pin into the socket. NOTE : The pin must be oriented so as the hole is located downwards, and away from the white locking mechanism. This hole is used by the tongue to secure the Pin in place, and to prevent the pin and wire from being removed if someone pulls on the wire. The following picture show you the pin orientation, as well as the direction that a New Pin needs to be inserted in to the connector. Obviously, in order for you to add pins to the wiring connector, you will need to first REMOVE pins from an existing wiring connector. Although it may at first seem difficult to accomplish, once you have removed 1 Pin/Wire from a particular connector, it will become clear as to the best method to use to remove any and all pins from the wiring connector. Obviously the White Pin locking mechanism needs to be release before even attempting to remove pins from a connector. The second trick is to use a small flat headed screwdriver (A Jewellers one), or even the pointy end of some scissors. Once you have the tool jammed inside this hole, you will need to manipulate it so as you pull the locking tongue downwards, and away from the wire connector pin. Basically you are trying to pull the locking tongue away from the hole located on the pin, so as the pin and wire can be freely removed from the plug. If the locking tongue has been properly disengaged, you will not require too much force to remove the pin and wire from the plug. Unfortunately this step is rather difficult to describe in a document, but with a little patience, and studying the principals of how the pin/wire is held in place, you should be able to work out a method that works for you. To further confuse you, here is a picture of the above method used to remove a pin from an EF/EL socket, using scissors. As stated above, there is no real science as to the pin removal, its more a case of trial and error. Once you have moved, added, and removed all the required pins and wires from the Ford BA ICC Video Plug, it is a simple case of re-fitting the White locking mechanism. This is simply achieved by pushing the mechanism downwards into the plug, until it sits flush with the plug.